The Smart Strider 495 CSE was newly introduced for the 2017 model year, joining the 695 and 895 as part of the entry-level rear design series. It offers a nice array of features, including easy assembly, and is a decent choice in the price category. The ProForm Smart Strider 495 CSE features SpaceSaver design and commercial gauge steel construction. The Smart Striders have received positive reviews from experts as well as users, as they offer a nice mix of affordability and features. The 495 CSE is the base model in the rear-drive series, yet it has enough to keep most users satisfied. The 495 CSE features the unique Round Watts display, as does the mid-level 695 CSE model, which shows you exactly what power zone you are in: Endurance for slow and steady, Tempo for your ideal heart rate based on weight, and Peak which is your cardio max. It's a nice way to see just how hard (or not hard) you are training. You get iFit Coach, which is the company's immersive workout experience that you can access with your smart phone or tablet. You can tap into professional workouts, on top of the 18 built in, as well as view Google maps of any worldwide location, get nutrition and diet tips, track all of your results and much more. There is a yearly fee but it is nominal. As we mentioned, the 495 CSE offers SpaceSaver design, so you can easily fold it up after your workout and transport it to a closet or wherever else you store it with the transport wheels. You also get oversized pedals, easy assembly, iPod integration and an integrated tablet holder. Any negatives? There are a few. The 495 CSE does not have incline like the other models in the series, nor does it have a workout fan. The pedals are also not cushioned as they are on the others. Still, for under $600 on sale you certainly get a lot of features and capabilities. If you're in the market for a rear-drive entry level machine, the 495 CSE is a very good choice. It has the power display, iFit technology, 18 work outs built in and easy assembly. However, for just a few hundred more you can get incline capability as well as a fan, plus even more workouts and resistance levels. As such, for our money we would look at the 695 CSE as well as the top of the line 895 CSE, which gives you a 7" touch screen with internet, free wireless heart rate chest strap, more workouts and cushioned pedals. Any way you end up going, the CSE series is a nice upgrade from previous rear drive models and will give you a very good workout. 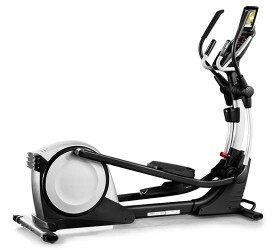 The ProForm 495 CSE elliptical is on sale right now!